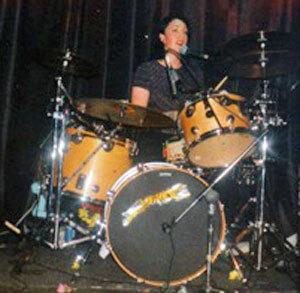 Emily Marsh started playing drums before she could walk; sitting on her father’s snare drum with his drumsticks in hand. Dinners typically ended with everyone playing their empty glasses and plates with forks, knives, and chopsticks. It was an acceptable form of dinner conversation in 1970’s San Francisco, and a pretty nice introduction to building a life around creative expression. Emily continued to play, braving middle school jazz band and later forming and/or joining bands in Vermont, LA, New York, Seattle and San Francisco. Her Vermont college band Table Grade enjoyed a brief stint on the lonely stages of Hollywood clubs (typically playing 6th out of 9 bands,) and dining with the famed Rodney Bingenheimer — a failed attempt to make it big in 1992. Moving to New York, Emily found a spot in the all-female vegan Heavy Metal band Screaming Venus. Playing venues such as CBGBs and the Continental secured her passion for playing shows, and she made her way to Seattle in 1993. It wasn’t long before Emily started bartending and more bands took shape: First, Basement Ring, then Faster Tiger. Faster Tiger put out their CD “Little Things”in 1999, played live on the radio (KCMU) and at festivals like Bumbershoot and NXNW. They were almost flown to Alaska, but got bumped from the gig by Blue Oyster Cult. The band played for several years, touring some and building a local fan base, sharing the stage with local and touring bands including Yo La Tengo, 66 Saints, Sleater Kinney and the Fastbacks. Other projects around this time included collaborating with Larry Barrett on his album The Big Slowdown, and in the Kinks cover band The Kwabs. Yo La Tengo bass player James McNew invited Emily to sing with him onstage at a Dump show, where she met Allen Callaci of Refrigerator and later recorded backing vocals for their album Comedy Minus One. Not long after Faster Tiger disbanded, Emily joined the Black Cat Orchestra (BCO). Playing sets made up of Latin American, Eastern European and Asian music expanded her percussive repertoire. BCO collaborated with Mirah on an album of political protest and anti-fascist songs, toured and played several music festivals. The BCO warmed the stage for Ralph Nader, KD Lang, played original music for silent films at On the Boards and the Portland Institute of Contemporary Arts, and performed an original score for 33 Fainting Spells dance performance, September, September. Emily left bartending and entered graduate school for social work in 2002. There she met Steve Moriarty who, like her father, is an accomplished drummer himself. The two earned their social work degrees and moved to Oakland, CA, where they now live and work. Emily joined San Francisco band Vervein, put out an album and toured with American Analog Set before taking a break to focus on her psychotherapy career in the Oakland schools. Now the program director for her agency’s Oakland public schools program, Emily is not playing music seriously but recently recorded with Mirah and Thao Nguyen for a New Orleans benefit album. Emily is thrilled to be part of the These Streets roster of uber-talented musicians, and cherishes the time she spent making music in Seattle.